Gamers outside of Japan rejoice: Nintendo has decided to grace other regions of the world with its new Super Mario Bros. collection. Less than a month ago, Nintendo celebrated the 25th anniversary of Japan with a special website and a re-release of Super Mario All-Stars on the Wii with bonus content. Though it wasn't assured that this collection would also make it to other regions, Nintendo has just announced that the rest of the world will be able to join in on the classic Mario fun too. That is, at least Europe will be able to join in on the fun for now. The Super Mario All-Stars: 25th Anniversary Edition for the Wii has been confirmed in Europe for release on December 3, with pricing not yet mentioned. 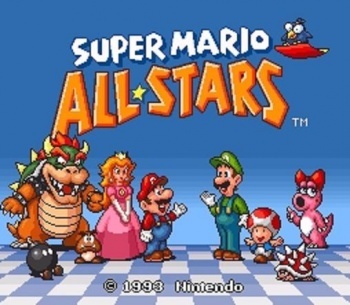 Super Mario All-Stars was originally released on the Super Nintendo in 1993. It included Super Mario Bros., Super Mario Bros: The Lost Levels, Super Mario Bros. 2, and Super Mario Bros. 3, all upgraded with 16-bit graphics. The Wii collection doesn't upgrade the graphics again, but it's at least an accurate port of the original SNES title. It also features a booklet detailing the history of Mario and an awesome soundtrack CD containing Mario tunes from the past 25 years. And it comes in a spiffy red box. Though only confirmed for Europe at the moment, I'd be astonished if it wasn't only a matter of time before Nintendo confirms a North American release as well. Super Mario Bros. was released in Europe more than a year after it hit shelves in North America, so there's no major reason for Europe to be able to celebrate significantly earlier than everywhere else. We'll keep an eye out for an announcement later today or this week.